As with any other game, chatting is a very essential aspect in the game of RuneScape. 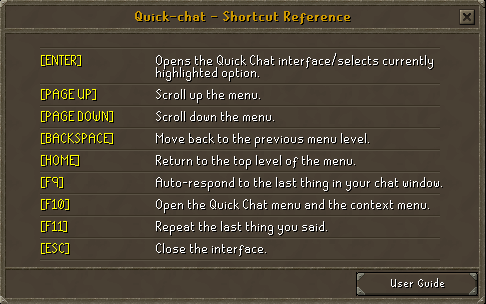 In May 2008, however, Jagex introduced a new feature into the game, quick chat, which would allow faster and easier chatting between RuneScape players. Additionally, this update will now allow muted players to talk as there are no obscene or rude statements in it. But because there are no rude or obscene statements, quick chat has also allowed children under the age of 13 to play, being that they can only use quick chat to talk. If you are looking to enjoy grammatically correct chatting all in the comfort of the world of RuneScape, quick chat is one of the greatest updates that Jagex has brought about to you. This guide will show you the capabilities of quick chat, and how to use them. To access quick chat, you must first click on the icon next to your name, or hit "enter" on your keyboard. Doing either one will bring up the quick chat interface. After opening the quick chat interface, you can click on different subsections to see the different varieties of messages in which you can chat with. There are many different subsections, and each one has its own purpose. There are certain subsection letters in which you can hit on your keyboard when quick chat is open. Hitting the letter aside a category on your keyboard will open up that category, and from there you can move onto clicking other keys to move onto different subsections. For instance, if I press "G" when the main quick chat interface is open, it will open up "General." From there, if I happen to press "r" again, it will open up "Responses." As you can see, I can now select a message. I can either manually click on the message, or as I did with the subsections, click on the corresponding key. I happen to press "8" and my message is "Sorry." To move back a subsection, you can hit on the "backspace" button on your keyboard or use your mouse and click on the preceding subsection. Trade/Item: Information about different items in RuneScape. You can also request item trades. Skills: Has statements pertaining to the different skills in RuneScape. Group Events: This subsection is for RuneScape events. It is particularly useful if you are organizing one. Clans: Statements that are used by clans. These statements are primarily used at Clan Wars. Inter-Game: Statements that can be used by both FunOrb and RuneScape. If you would like to use them, quick chat has its very own hot keys. You can use these hot keys to quickly get to certain functions of quick chat. If you would like to view this list, you can click on the icon in the quick chat interface. There are many neat things about Quick Chat, more than were previously explained. For instance, you can use quick chat on your clan chat, private messages, and you can even easily reply to another's quick chat messages. It is quite simple to use Quick Chat on your clan chat. As always, you should hit the "/" button on your keyboard to begin a clan chat message. From there, all you have to do is access quick chat and enter in your message. Something similar would go for private messaging. You need to right click a username, and click on "Quick Message <username>". Choose a message and then you are all set. If you find that someone on your chat screen has said something with the icon next to the message, you can click on the icon and quick chat will come up with suitable responses to that statement. If you click the icon or right click "quick response", there will be a list of appropriate responses in which you can reply with. Additionally, if you are looking for serene RuneScape environments, then try the quick chat worlds (World 160 and 161.) All the fun in RuneScape without the annoyance of other players. There is a very low chance of obscene statements, as only quick chat queries are allowed in those worlds.